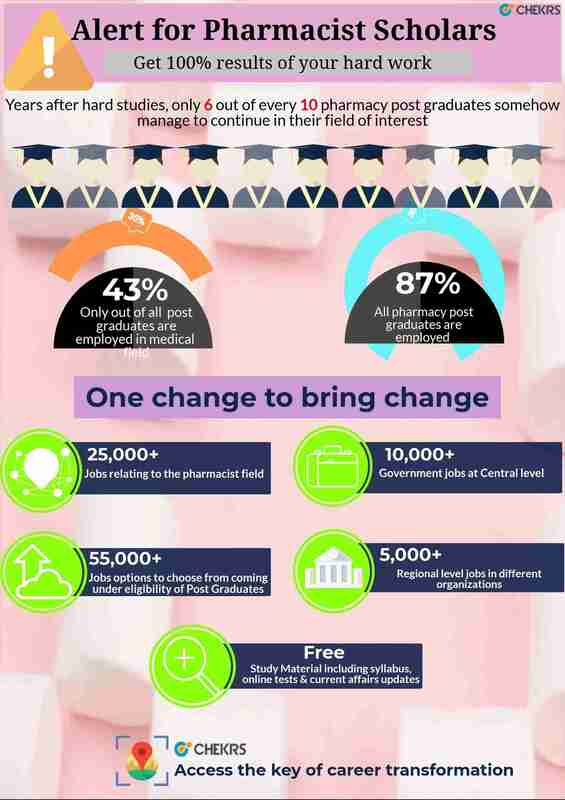 All the Pharmacy post graduates, are you aspiring for a Jobs after M Pharma? If yes then we are here to put down all your efforts wasted in searching. At Chekrs we bring you the solution where you get a chance to know all the possible M.Pharm Job Opportunities. Having a government job right after completing the post graduation is no less than a blessing. If you are pursuing your higher studies or have completed it; anyway if you have concern to get a decent M.Pharmacy Govt Jobs then Chekrs relieves you from all of them. Here we bring you the jobs that would definitely match your interest level and help you succeed. The M Pharma Sarkari Naukri may range for different levels such as central, state or even a few reputed organizations such as: M Pharma Job in Railway and many more. The private institution is filled with ample of M.Pharma Fresher Jobs for different institutions. For all of the job seekers looking a fair chance after post graduation can turn Chekrs as their notifier from where you can easily all the job chances after graduation. The Job for M Pharmacy notifications are brought from prestigious organizations coming such as Glenmark, Ranbaxy, etc. To receive such jobs daily which are Latest Job for M Pharm or upcoming M.Pharmacy Government Jobs you can get the subscription for free and avail the services for free. Why Chekrs for M.Pharma Latest Jobs? Our priority is to help the candidates be comfortable every way; hence you can easily view the jobs as M Pharma Jobs in Mumbai, Pune, Bangalore, Kerala, etc location. Along with it as the competition is not so easy, here we bring you the complete study material that will help you excel in the studies related to competition of getting job. You can use our previous papers, mock tests and also daily basis quizzes.